As kids graduated from school and moved out on their own, we became "an Air Force family" with Jim, Paul, Gary, Jerry and Don all enlisting in the Air Force. Seems everytime a holiday came around it'd bring one to three blue-uniformed brothers home with it. It was great and gave us an opportunity to enjoy our biggest family vacation, touring Webb and Lackland AFBs in Texas and Eglin AFB in Florida. I have never put these thoughts on paper. I have told a few bits and pieces here and there. This is how I thought after Jim was MISSING. Such an unGodly term!! Immediately after, I was so very sure he would walk out from his hiding and be recovered (after all during survival training in the Philippines they could not find him), that I called mom and dad every few days to see if they had heard anything. It sure made it hard on them. I felt so isolated (in Calif.) and I thought they just forgot to call me, even though I knew that wasn't true. I should have come home. (I was pregnant with Kathy just a few months plus having two other little ones.) I used to dream frequently that I was in Laos looking for Jim. Because I had no idea of the real circumstances of imprisonment, I always dreamed I was there looking through "BARS" for Jim. I never saw him, I was always looking. In the "day time" I always envisioned a fiery crash into the mountainside of Jim's plane. I guess that was Gods way of telling me the reality of it. I never really gave up hoping until I read the book that Jerry and Roger found and read, My Secret War in 1989. Then I understood better and believed. I lost some hope after the war ended and the Gov't told us (families) to back off and give them a chance to bring these men home. When we realized they were not going to bring home or account for everyone, I had not the heart or hope to go back to speaking two or three times a week as before. I had been fighting to bring home (Jim, hopefully and if not, at least) any prisoner of war. I always had to expose my inner most feelings and pain in my speeches to strangers. Totally against my nature, at that time! When I lost hope I could no longer go back and do that. I do think it is unforgivable for our country not to do everything in its power to bring home our servicemen and to account for them. Jim is gone and I have come to terms with that. It still is not easy and brings tears to my eyes frequently. What a loss! We all loved him so. It helps that we are a close family and it helps we believe in God. Thirty years later, you would think it would be easier or better, but it is still hard. What a loss!!!! I have learned to be expressive regarding my emotions and not bottle them up mostly due to the loss of my Kathy. I did tell Jim how we all loved him as I knew we as a family did not always express it verbally. I wrote him a letter and stuck it in his suitcase before he left, to find later. He did. So, with these thoughts, I send my love to you, also. A Tribute is given in recognition of the Living, a Eulogy is offered for the remembrance of the Dead. Sadly, today, I can do neither, for depending on whom you ask, Capt. James Wayne Herrick, Jr. is neither living, nor dead. I can share with you, however, a young Air Force pilot, whom I have never met, yet played a pivotal role in who I am today. His spirit still moves among us. I was 16 when James Wayne Herrick, Jr. first entered my world. Three years earlier his plane had disappeared while on a bombing run over the Ho Chi Min Trail in Southeast Asia. I was idealistic, anti-war and very outspoken. Every night, for as long as I could remember, the 6 and 10 o'clock news had flung the Vietnam War into my living room. Scenes of wounded soldiers slogging through jungle mud and military leaders promoting daily enemy body counts were as common place as the local weather forecast. Being a writer for the school newspaper, I decided to research if any families in our town, or surrounding area, had been directly affected by the war. The name of Lt. James Wayne Herrick, Jr. surfaced. James Herrick, Jr. was the oldest son of a couple who resided only 7 miles from my home. He had one older sister and 7 younger brothers. Lt. Herrick was listed as a casualty on Oct. 27, 1969 ... just one day before his 25th birthday and one week before he was to return home on leave. This information was printed on a card tucked inside a packet I received containing a metal bracelet with Lt. Herrick's name and casualty date stamped on it. It was a POW/MIA bracelet. Lt. Herrick was listed as MIA, missing in action. I struggled to understand the horror of the situation. This was not what I had expected when I began my research. Naively I had not thought beyond a name on a list. I had not thought of the person, the son, the brother who was now gone. My safe sheltered world seemed shallow and insignificant as I contemplated the fact that only a few miles away, another families' world had been plunged into a nightmare of the unknown - a nightmare that would last 29 years, and more. With a new perspective, I wrote a tribute to Lt. Herrick for the school paper. It was published in April of 1973. Lt. Herrick's mother read it, clipped and saved it, tucking that scrap of paper away with other documents pertaining to Jim - as they affectionately called him. Jim was a great kid, according to his parents and siblings. He was always ready to laugh, enjoy a practical joke on his older sister, or generally have a good time. His brothers recall the time Jim convinced them to creep into their sister's room early one winter morning and carry her kicking and screaming outdoors to be unceremoniously dumped into a snow drift. Despite such pranks, Jim and his sister Barb were very close. Only 9 months apart in age, she doted on her baby brother. The news of his disappearance devastated her and, like anyone who loses a loved one, guilt filled memories mixed with those of happy times. "I remember when Jim was coming down with polio," Barb relates. "We were walking to school, taking the short cut through the pasture, and Jim was walking so slow. We were going to be late and it was making me mad. Jim kept complaining that his legs hurt, and I thought he was just making excuses not to go to school. I was so mean and bossy to him." To this day, the image of her younger brother trailing behind haunts her. Within hours, 7 year old Jim was stricken with paralytic polio and rushed to the Children's Hospital in Des Moines. But by the summer of his eighth birthday, family medical records note he was completely recovered with no trace of paralysis. Because of his complete recovery as a child, years later, when the official casualty notice arrived, Barb would not accept Jim's possible death. "I felt my brother had something important in life to accomplish because he survived as a child," she confides, "so in my mind he had to survive as an adult." Lt. Herrick's mother, however, did not share her daughter's hope for Jim's survival. According to family members, Mrs. Herrick knew something was wrong on the day of Jim's disappearance. She had 4 sons in the Air Force at that time and on Oct. 27, 1969 she shared with her husband that she knew something was wrong with one of the boys. Lt. Herrick's father tried to reassure his wife that she had seen too much on the news and was worrying too much. He should have remembered to whom he was talking. Jim's mother was not a worrier - she had a deep faith in God, which she had passed on to each of her children - especially Jim. The family Bible bears the names, birth dates, and baptisms of each child. Next to Lt. Herrick's name is the entry June 22, 1956 - baptized into the Church of Christ. At the age of 12, Jim had chosen to declare his faith in God. This faith was expressed time and again through his teen and college years. He rarely missed a church service and often volunteered to fill a teacher vacancy as needed. My husband remembers Jim teaching the Jr. High class one Sunday. Amid the violence and disrespect of the 1960's Jim encouraged the class to show their parents the respect they deserved. He, himself, greatly admired his own father who worked 2 jobs to feed a houseful of hungry boys. 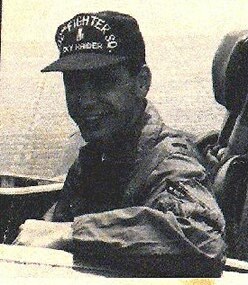 Later in flight school, Lt. Herrick would be nicknamed "The Preacher". Not that he lectured his buddies on their morality, but rather, they say, he had the courage to say "No" to the drugs, alcohol and girls so readily available to fighter jocks. All these things Mrs. Herrick pondered through the long night of Oct. 27, 1969. The next day, a dark sedan pulled up in front of the small, white house in Panora, Iowa. Two men in uniform walked smartly up the drive, a manila envelope tucked firmly under the Senior Officer's arm. "He's gone," is all Lt. Herrick's mother would say . . . "He's gone." She quietly retreated to her memories - memories of a dark haired boy with laughing eyes. Memories of a child who bandaged and nursed every sick or wounded animal he found and memories of a man who studied veterinary medicine as he worked his way through college. Memories of scout trips and summers at church camp. Memories of the pride she felt as they pinned silver wings on his chest. Memories sealed forever in a mother's heart. Three years later, Lt. Herrick would enter my life, never to leave, and his spirit still moves among us. The article I had written was read by a younger brother who wanted to know more about the young woman who asked readers to Never Forget those brave soldiers still missing. That younger brother, Roger Herrick, became my husband. 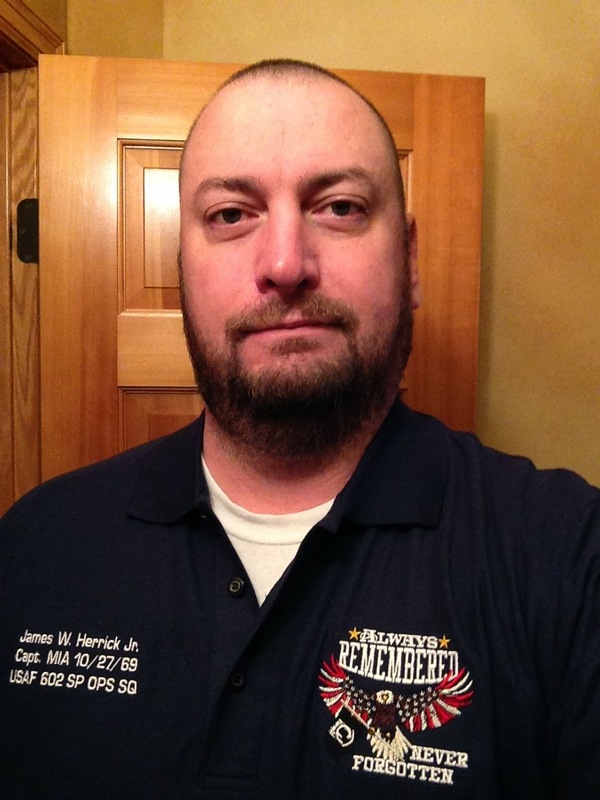 Lt. Herrick's story does not end here, even though his family prays daily for an end, for answers that may never come. Throughout the last 29 years, his spirit and memory slumbers at times, and then - without warning - we hear from Jim again. His spirit moves among us! Late one night in 1989, my husband was reading a small paperback book entitled My Secret War by Richard S. Drury, which was first published in 1979. 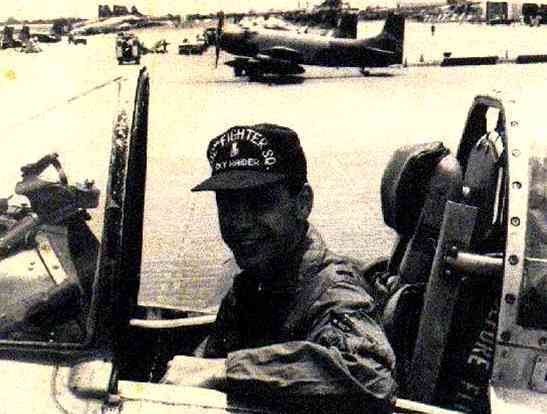 Richard Drury had served at the same Air Base in Laos as Lt. Herrick. Suddenly my husband was shaking me awake, telling me, "read this" as he pointed to a section of the open book. I groggily started to read . . .
"The wing has lost another pilot," the colonel's words started. "A young Lt. named Herrick went in up north." I couldn't believe my eyes. A cold chill spread over me. I looked at Roger who was lying still and ashen beside me. His breathing was rapid, eyes squeezed shut with tears trickling down his cheeks, fists clenched. I read on . . .
"To him it was a young lieutenant, to me it was Jim, a buddy, a living, breathing entity with feelings and thoughts. An individual person. He had just been relegated to a teaching aid on the blackboard. . . . the meeting ended. We all stood. Jim had been dismissed and the remnants of the episode were strewn across a mountain in northern Laos and represented in white chalk on a green blackboard. It was over for the leadership who could get a fast answer, cover their fannies, and move on to more important things. The real reasons, the basic laws, the discussions that had to take place, never did. The fact that Jim had gone down to get a truck, that he had spotted the enemy and was attacking, that Jim had been fighting in the war, was never mentioned. We were sick at how his bravery was treated, even though he shouldn't have broken formation to attack. That was what needed to be discussed. And of course, one other item escaped everyone. Jim thought the war was for real." I could not believe what I was reading. I read it again. And again. You see, it was 20 years to the month that Jim had disappeared. Not only was his name leaping off the page at us, he was telling us what had happened. The family had never received this information. The sanitized, official Govt. report stated only that Capt. Herrick was flying an A1H aircraft on a reconnaissance mission with 2 other aircraft. All three entered a cloud bank, only two planes emerged. The report also stated Lt. Herrick gave no signals nor returned attempts to contact him. Twenty years later, from the pages of a paperback, Jim reached out to his family and a bit of the Truth was revealed. Even today, in 1998, his spirit still moves among us. The young pilot who learned to fly in college ROTC, and thrilled at every moment he spent in the air, reaches out, touching his family's lives. This year, a brother who lives in Iowa, and one of the 3 who were serving in Vietnam in 1969, was sorting through a stack of old real to real tapes. He came across a tape recording Jim had made just 1 month before he was declared missing in action. Copies were made and sent to all the siblings. When the tape arrived at our house, my husband appeared hesitant to play it. He carried it around, laid it on the table, and busied himself with unimportant tasks. Several hours later he took my hand and we sat in the dark, listening, as a soft voice laced with a slight southern drawl filled the room. Tears welled up in my eyes as the words flowed around me. This was the man who had given all for his country, his family, and for me. It was as if he had reached through time and was there with us. . . . . filling the room. . . . . . sharing his daily routine. . . .asking his younger brothers about sports, about school and of course about Princess, the beloved family dog. He told his Mother not to worry - things weren't too bad over there - and asked his Dad how the car was running. He told them he loved them all and would see them soon. It was the last recording he would ever make. In the dark, his spirit was moving among us. Looking back over the past years, I am no longer surprised when Jim's spirit and memory surfaces. Not only does he reach out to us in unexpected ways, at unexpected times, but the Government also resurrects him on a regular basis. Just when the family begins to feel normalcy returning and the heartache dulls with the continuation of life, a manila envelope bearing the Dept. of Defense seal will arrive, splitting the emotional wounds open afresh. In a halfhearted attempt to account for the over 2500 Americans still missing in Southeast Asia, the Government continues to research, interview and corroborate information related to such cases as cannot be closed. Lt. Herrick's file cannot be closed. Excavations of the possible crash site have been on going, but results have been inconclusive. Interviews with eyewitnesses, 30 years later, have yielded - not surprisingly - conflicting descriptions that torture the imagination. Yearly packets of redundant forms, documents and status reports must be gleaned for any new tidbit of information. Sadly, little comes of it but a resurgence of heartache and poignant memories. 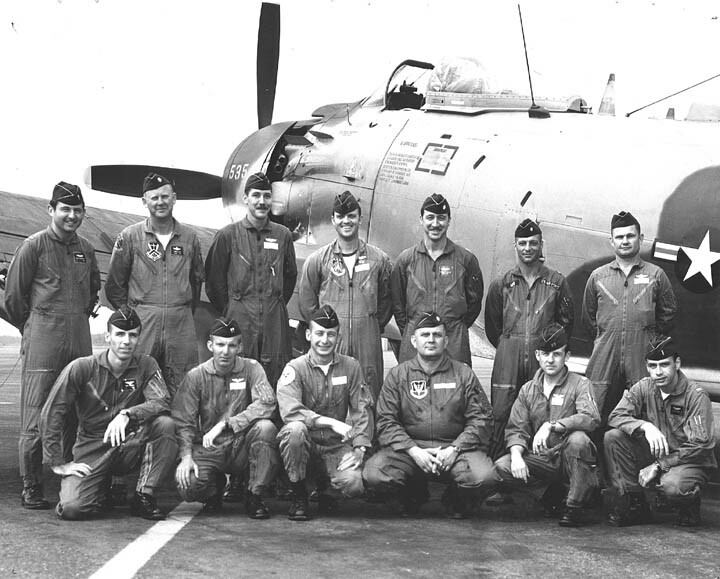 In November of 1977, Lt. James Wayne Herrick, Jr. was posthumously promoted to the rank of Captain, and awarded the Purple Heart, Distinguished Flying Cross, and the Air Medal. To his family he will be always loved, deeply missed, and never forgotten. I am humbled when I realize that his sacrifice has shaped the person I am today. I owe much of my personal happiness to a young pilot whom I never met. And Jim knows this... for his spirit moves among us. I am honored to have been accepted into his strong and loving family. I proudly wear the name of Herrick. Darkness falls without a sound that mortal ears will ever hear, a black lace curtain, swirling down, the falling of a crystal tear. So quick it cuts away the sun, a teardrop on a candle flame, and darkness comes to mark the place that's empty now, but for a name. But many times 'tween dusk and dawn, half-hidden in the early mist, we think of you as you once were, bright and laughing, sunlight kissed. I'm including links to on-line maps from a friend, Jim Henthorn. He served at NKP 11/67 - 5/69 in the 21st Helicopter Squadron. I've included several links from his website. The last link is to the area around the Bird's Head on Route 7 where Jim's plane crashed. 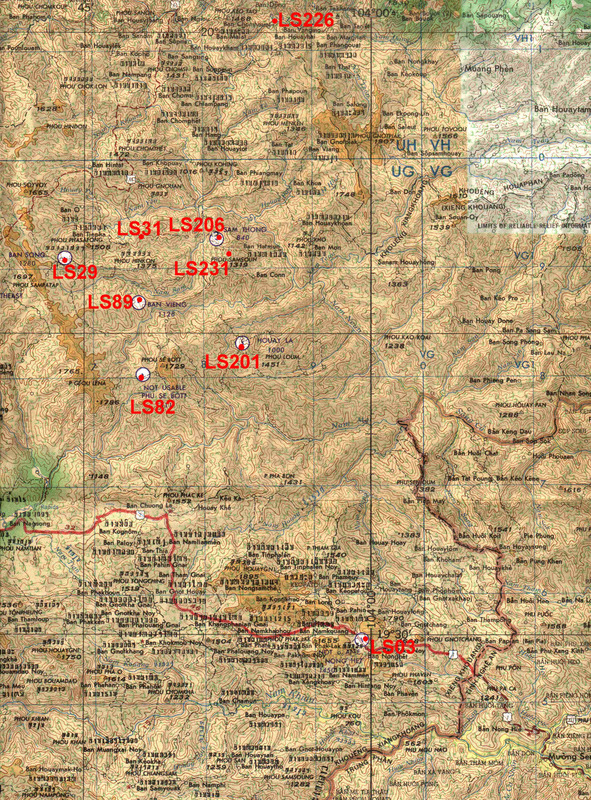 On that map, find Rte 7 and the Lao/NV border in the lower right region. Rte 7 is marked with a highway sign and is colored in red starting at the border. Trace Rte 7 west the distance to Lima Site 3 (LS03). Trace that same distance west again, this time starting at LS03. You should be a clik or two east of where Rte 7 swings N. As near as I can tell from JTF/FA reports, this is the area where Jim's plane went down. I've been promised more info from a reliable JTF/FA guy (from Las Vegas meeting) and maybe it will help pinpoint the site. Working from memory, I believe Jim's coordinates were 103deg50'10'E 19deg30'10'N There are discrepanices in these coordinates in the various after-action reports dating from 10/27/69. Hopefully, the files coming from JTF/FA will help resolve these discrepancies. I'll let you know if anything develops.